From Sacramento: take Interstate 80 Westbound. Exit Mace Blvd and turn right at the end of the off ramp on to Mace Blvd. Mace turns into Covell. Off of Covell turn left onto F Street. Parkside Apartments is between Covell and 14th Street, across the street from the Davis Community Park, next to the Baseball Field. From San Francisco: take Interstate 80 East bound and take Highway 113 towards Woodland. Take Covell Blvd. Exit and turn right onto Covell. Make right onto F Street. 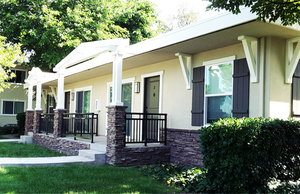 Parkside Apartments is between Covell and 14th Street, across the street from the Davis Community Park, next to the Davis Little League Baseball Field. From UCD Campus/MU: take La Rue Road make right onto Russell Blvd. Stay straight on Russell to go onto 5th Street. Turn Left onto F Street. After passing 14th Street end at 1420 F Street.